Ok....so I've been hooked on the food network as of late. I simply cannot get enough food competitions and cooking shows. My very favorite food network chef is hands down Ina Garten. (the barefoot contessa) She made these yummy pears with bleu cheese, dried cranberries, and roasted walnuts. (btw...this is the foodnetworks photo.....her's was much prettier than mine). I had to give it a shot. Here is the recipe if you are interested in trying it yourself....oh my you won't be disappointed. Well, I printed out the recipe wednesday before heading to the grocery. I came back and made the easy roasted shrimp cocktail and decided i would make this later this week. Which I did today. I had to. I was dreaming of it all night. And it did not disappoint. So yummy and spicy and sweet all in one bite. And that got me to thinking how I think my new interest in cooking (or at least trying to) is somewhat related to painting. The movie Julie and Julia enlightened me to the fact that inspiration can come from anywhere.....food, photos, experiences. the list could go on. In cooking as is in painting...... its the melding together of like or unlike substances (ingredients/mixed media) and working with many textures to create something new and yummy. I shall continue this new love affair with cooking and hope to be inspired in new ways. Next on the agenda is Emeril's Shrimp and Pasta in a tomato-chile cream sauce. Oh how I love shrimp. 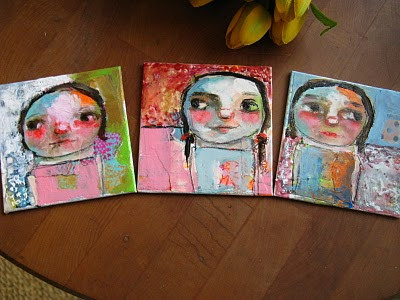 I've been focusing on these cute, little mini portraits. 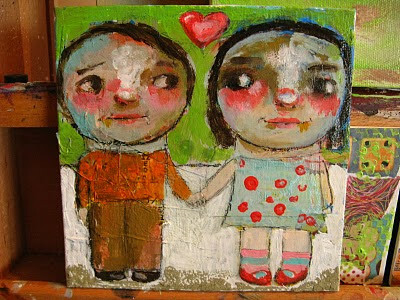 They are made using acrylic paint, (loving the golden heavy body paint), encaustic, paper, graphite, and shiva oil sticks. I've also been working on things for a show next month. Its near my hometown in Newport, AR. This is only the 2nd year for the show. I was blown away at the support and love of the locals and the overrall experience I had there. Cannot wait!! you made me hungry girl! i LOVE the food network too. i went back to the bookstore and bought the issue your sweet sailor is in. i am just so proud of you. i LOVE to try new ones. I just found your blog - wow - I love your style! Amazing work, your faces are so expressive. I just wanted to say hello! did i see a peak of something of yours on something of someone else's we know? can't wait to see you soon my dear.